We have the misfortune of having a crowd of cicadas move into our neighbours hedge. They make an incredible racket all day long. This one was sitting on our garden wall the other evening so I tried taking some shots of it. Not having a proper macro lens I used my 50mm f/1.8 with a close-up lens. This was the best shot I could manage. I’ve tried to record the terrible sound they make but despite it being a horrible assualt on human ears, the sound recorder on my cell phone doesn’t record it. All you hear are the background noises in absolute silence. I virtually had the phone in the hedge so it must be something to do with the pitch of the sound they make. 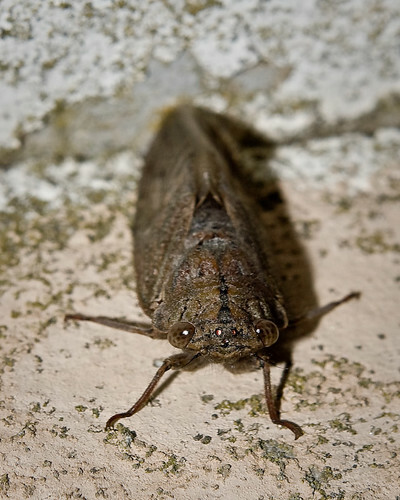 This entry was posted in Photos and tagged cicada, insect, noise, noisy, pest. Bookmark the permalink. That’s just very ugly looking! Yes, they are pretty ugly; and the Wikipedia article says they’re commonly eaten in many parts of the world. Just the thought gives me the creeps. Definitely not amongst ‘Life’s Most Beautiful’. Nice focus on the eyes tho’!